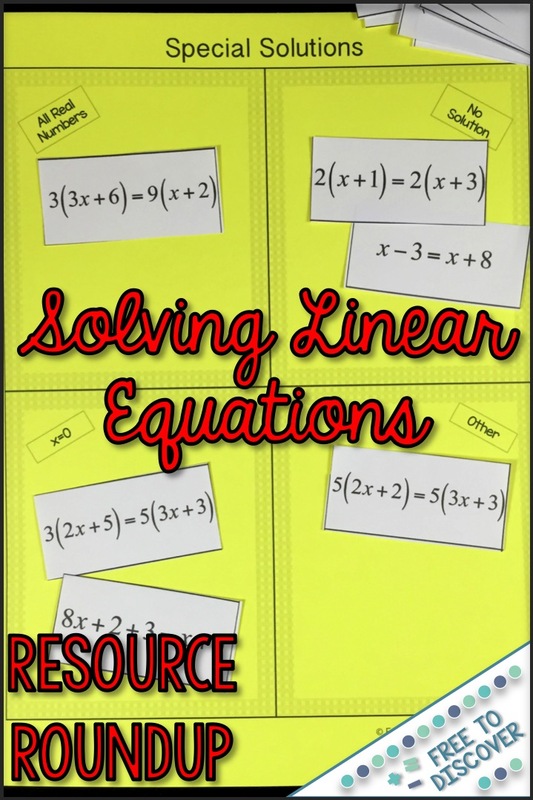 Last year I wrote about my favorite tips and tricks for teaching linear equation solving. See the original post here. Today I’d like to highlight some fun resources that you might enjoy in your classroom. Have you checked out my new line of differentiated resources? I am currently working on differentiated notes and practice for eighth grade math. The linear equations unit is almost complete, and you can scoop up a FREE comprehensive lesson on Solving Equations with the Variable on Each Side today! Mandy from Math Dyal shared an awesome blog post about her favorite activities for solving equations. Read more about how she uses puzzles, coloring, interactive notes, and more to engage her students in meaningful math practice! Karrie from Mrs E Teaches Math has an awesome FREE Solving Equations Stations Maze. This is such a fun way to get your students moving around the classroom and engaged in a meaningful math activity! 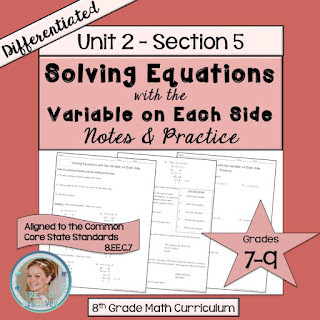 Randi from 4 the Love of Math has a super helpful FREE Solving One and Two Step Equations: Basic Guided Notes resource available for download in her TpT store. Awesome review for Pre-Algebra and Algebra students! 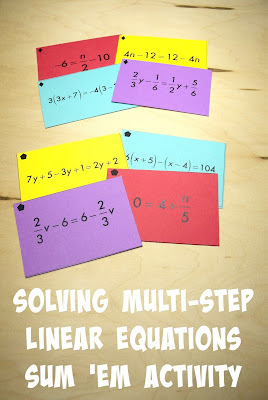 I also have a FREE Solving Multi-Step Linear Equations Partner Practice Activity that I created for Christmas, but can really be used at any time of the year! This is a great way to ensure students complete their own work, while having the ability to check with a partner. My most popular linear equations resource includes a discovery lesson and card sort!